(Nanowerk News) Contrary to previous assumptions, electrons are catapulted out of an atom during photoemission with a delay. When physicists search for new semiconductors for chips or lasers, they have been able to rely on sophisticated computer programs - until now. However, it is possible that the models these programs have used to predict the electronic properties of a material oversimplify reality. 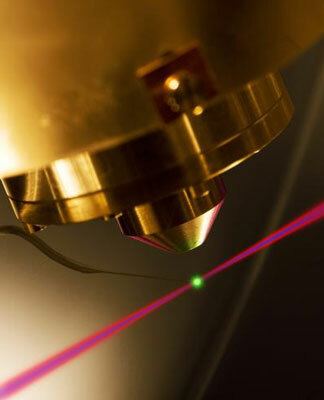 An international team that includes researchers from the Max Planck Institute of Quantum Optics has now determined this from measurements with extremely short laser pulses. The physicists have concluded from this that electrons which a laser pulse knock out of an atom are catapulted from the particle with a delay of several tens of attoseconds. One attosecond corresponds to a billionth of a billionth of a second. The assumption so far has been that, during photoemission, electrons immediately shoot out when the light pulse impinges on the material. The models with which quantum physicists describe the electronic properties of matter are also based on the electrons behaving in such a way. These models could therefore be too imprecise, at least as far as very accurate predictions are concerned ("Delay in Photoemission"). Physicists rarely rack their brains over things they cannot investigate. Since the discovery of photoemission more than one hundred years ago this has also applied to the question of how quickly a light beam ejects an electron from an atom, because it was clear that the process would in any case be much shorter than even the most accurate methods could measure. Physicists therefore simply assumed that photoemission was instantaneous; there was no delay between the light impinging and the electron's escape. "This oversimplified reality," says Martin Schultze, one of the researchers at the Max Planck Institute of Quantum Optics in Garching, who has disproved the school of thought together with colleagues from the Ludwig Maximilian Universität München, the Technische Universität München and partners from Greece, Austria and Saudi Arabia: "We discovered that there is a delay in the photoemission." In the same way as the best sprinter does not fly off the starting block at precisely the same time as the starting shot is fired. Accordingly, it takes a few tens of attoseconds before an electron flies out of the atom. Although this is only a few billionths of a billionth of a second, even this fleeting moment is sufficient to rattle the theory that physicists have put forward about what happens electronically in the atom. "Our findings provide further important insight into the interactions of electrons in atoms," says Ferenc Krausz, in whose department at the Max Planck Institute of Quantum Optics the experiments were conducted. When an electron is prized out of an atom, this is not something that an electron merely settles with the light pulse. An event of this type always concerns all electrons in the atom. Without simplifying assumptions, even the most powerful computers cannot simulate the joint motion. They therefore estimate the influence of the electrons which are not themselves ejected from the atom in the photoemission with an average value. Now researchers from the team have tried, for the first time, to see whether they can feed the known models with initial values so that the simulations reproduce a delayed electron start. And indeed: If the established models are tweaked accordingly, they also calculate the delay, but estimate it at a value that is only one fifth of the measured delay. "They obviously make a systematic error here," says Martin Schultze. Theoreticians can now refine the models in such a way that they reflect the delayed electron emission and can also obtain more precise statements regarding other aspects of the electronic behaviour. "This should be particularly important where the issue is the electronic transport properties of a material," says Martin Schultze. For example, when searching for semiconductors or materials with specific properties for electronic applications. The fact that the physicists can now look in more detail at photoemission is attributable to attosecond spectroscopy: "It is only recently that we have been able to observe processes that last only a few billionths of a billionth of a second," says Ferenc Krausz. However, even the extremely short laser pulses do not constitute a stopwatch with which the absolute starting time of an electron after the arrival of a laser pulse can be measured. "Instead, our experiments give a very reliable indication, so that we are able to deduce the delay and estimate its duration," explains Martin Schultze. He and his colleagues have measured the time difference with which electrons start from different orbitals. An orbital describes the space in which an electron is located, and also determines the reaction of an electron to the laser bombardment. And just as different sprinters differ in how well they fly off the starting blocks, the electrons also do not fly out of different orbitals with the same delay. The physicists apply a clever trick to measure the difference between their starting times. Their test object is a cloud of the noble gas neon and they focus their sights on electrons from two orbitals. They now chase the pulse of very energetic ultraviolet light onto the atoms, a pulse which flashes for only a few tens of attoseconds and knocks different electrons out of the noble gas particle. Moreover, they also beam an infrared laser pulse, which last around 40 times longer than the ultraviolet flash, onto the atoms. They synchronize both pulses such that the shorter ultraviolet one always impinges on the atoms when the longer infrared laser wave is already there. As soon as an electron leaves the atom, it senses the oscillating electromagnetic field of the infrared pulse. The electron is accelerated or decelerated slightly as it leaves the atom, depending on whether it falls into a trough of the infrared laser wave or hits a crest. The direction in which it is nudged depends, on the one hand, on how the light waves of the two pulses coincide when they hit the atom. The researchers can control this very precisely. However, it also depends on how much the start of an electron is delayed, namely also on the orbital from which it originates. By varying the position of the short ultraviolet pulse within the longer infrared one, they then obtain an idea of when different electrons are accelerated or decelerated. From this immediately follows how the start times of electrons from different orbitals differ. In the case of the electrons which the team of physicists focused on, the result was a difference of around 20 attoseconds. "In order to measure their absolute value, we would need an atom in which the electrons start from one orbital without delay," says Martin Schultze. The undelayed electron would then provide the starting signal for the electron race, and would make it possible to have a stop watch for the delayed start times of the other electrons.